Pepperoni is a classic pizza topping offered at nearly every place that serves pizza. When you top off a pizza with pepperoni, the amount of calories in that pizza rises. 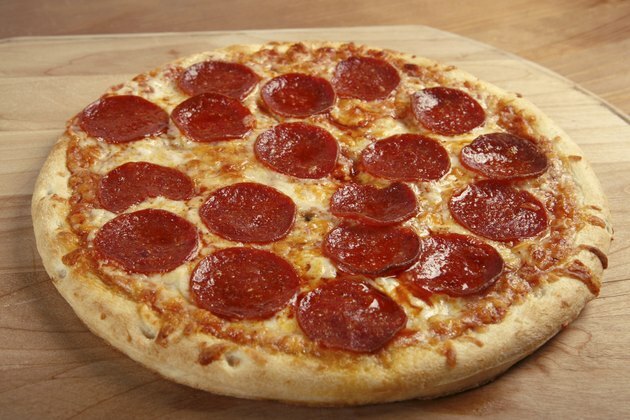 A large, 14-inch hand-tossed pepperoni pizza from Domino's has 2,370 calories. If you substitute thin crust for hand-tossed, the calories drop to 1,870. A large, 14-inch original crust pepperoni pizza from Papa John's has 2,808 calories. A large pepperoni thin crust has 2,160 calories. A large, original crust pepperoni pizza from Little Caesar's has 2,362 calories, while the large pepperoni deep dish has 2,486 calories.